Name: Erwin Bernard Templin, Jr. Source: Compiled by Homecoming II Project with the assistance of one or more of the following: raw data from U.S. Government agency sources, correspondence with POW/MIA families, published sources, interviews. SYNOPSIS: In early 1966, there were several search and rescue (SAR) destroyers parked off the coast of North Vietnam in the Gulf of Tonkin. When the attack and fighter people would egress, they would be there to assist a cripple or pick up a guy who had to punch out or ditch. During the night when the strike activity would ebb, the SAR DDs would steam around their small areas waiting for the next day's activities. It was during these night and early morning hours that high speed surface contacts would probe their positions. The "Stoof" (S2D) helped provide air cover for these surface ships. The Stoof was technically an anti-submarine aircraft, but had little call to exercise submarine missions in Vietnam. There were only a few of such planes assigned to Vietnam at all. If a ship thought its position was being probed by enemy boats, it would vector the Stoof out over the target. The Stoof tactic was to drop a parachute retarded flare from about 10,000 feet over the target, circle back around at a low altitude (about 300 feet) and investigate. If the target was unfriendly, then the S2 would engage and destroy it. There was a certain amount of risk involved in these operations, as the Vietnamese PT boats had radar that enabled them to strike with no visual contact. In the dead of night on January 22, 1966, a Stoof launched from the USS Hornet with pilot William S. Forman and crewmembers Edwin B. Templin, Robert R. Sennett and Edmund H. Frenyea. Their mission was to investigate an unidentified bogie. Their progress was under the advisory control of the USS BERKELEY, and no unusual circumstances were reported. About 6:45 AM the USS BERKELEY reminded the crew that their mission should be concluded shortly and they should return to the USS HORNET. Receipt of this information was acknowledged and it was reported that they had a surface contact and would investigate before departing the area. Shortly thereafter the aircraft disappeared from the radar scope of the USS BERKELEY. This was not considered significant or alarming at that time as it was believed the aircraft had gone beneath the radar to investigate its contact. 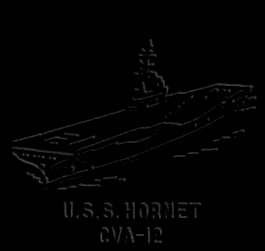 It is thought that the natural curvature of the earth caused the aircraft to go off radar approximately five minutes before they were scheduled to return to the HORNET. Their last known location according to coordinates was in the Gulf of Tonkin about halfway between the coastal city of Thanh Hoa, North Vietnam and the Chinese island of Hai Nan, although reports to some of the families placed them much closer to the island - about 15 miles away. Within a few hours of the disappearance, Radio Hanoi reported that an aircraft had been shot down near Bach Long Vi Island, North Vietnam. The Navy did not classify the men missing as Prisoners of War because this report could not be confirmed as accurate. The last known location of the aircraft was about 30 miles from this island. At 7:15 AM the USS BERKELEY notified the USS MAHAN that the aircraft should be inbound to USS MAHAN enroute to the USS HORNET. Upon receipt of this information the USS MAHAN tried unsuccessfully to contact the aircraft by radio and radar and subsequently reported the situation to the USS HORNET. Shortly thereafter search and rescue efforts were commenced and LCDR Forman and his crew were reported missing at sea. A close friend of Templin's was part of the effort. According to him, the weather was clear, and there was not a puff of wind. The Gulf was so calm that there was not a ripple on the surface, so that objects floating great distances away could be seen. The search parties found no trace, no oil slick and no debris indicating where the plane went down. According to Templin's friend, the search went on for the remaining months he was on station. He says, "Our squadron was uniquely qualified...we had the right kind of airplane and were working in the immediate area and more importantly...we cared. We found nothing." On February 1, 1966 the four-man life raft from the aircraft was found off the coast of North Vietnam approximately 152 miles from the last known position of the aircraft. The raft, which was identified by its serial number, bore no evidence of having been used and did not show any signs of damage by fire or gunfire. This particular raft is designed to automatically inflate when immersed in salt water. On March 14, 1966 a flight helmet was found by a friendly fishing junk and turned over to U.S. authorities. This helmet was picked up in the same general area as where the life raft was located and has been identified as belonging to Bernard Templin. When Templin`s friend left Yankee Station and was steaming away to safer waters, he was walking down a passageway and one of the Intelligence Officers from the Flag stopped him. They went to a secure area and he told Templin's friend that some very high-level intelligence had been forwarded to the ship identifying one or more of the crew members from the aircraft as positively seen in North Vietnam. Templin's friend naturally assumed that they were POWs. None of the crew ever returned. The four were maintained as missing until 1975, at which time a "finding of death" was made on the crew based on no information to indicate they were alive. Tragically, information has poured from Southeast Asia since the end of the war regarding American prisoners still alive in captivity. The U.S. Government has received nearly 10,000 such reports, yet seems unable to find the formula to secure the freedom of those Americans. HS-2 lost an SH-3 during operations in the Tonkin Gulf. The crew was later listed as MIA. Status: Body Not Recovered from an incident on 05/23/1967 while performing the duty of Pilot. Service: regular component of the U.S. Navy. Short Summary: North Vietnam. See Pettis. Service: reserve component of the U.S. Navy. Short Summary: North Vietnam. See Homuth. ADJ2 Ronald P. Soucy, Sr.